1 Somehow the words yo-yo and physics just don't seem to go together, but they do. Because if you want to know how a yo-yo works, the answer, in a word, is physics. The explanation for what makes a yo-yo go up and down, sleep, and do tricks is all based on concepts from physics. These concepts include kinetic energy, potential energy, and momentum. 2 There have been several kinds of yo-yos through the years. Each new kind of yo-yo used more ideas from physics to make it work better. Old style yo-yos had their strings tied securely to their axles. Newer yo-yos had their strings looped loosely around their axles. Even newer, automatic yo-yos have a built-in mechanism that make them come back up automatically. 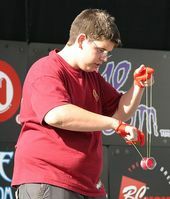 3 Once you wind up the string of a yo-yo, any kind of yo-yo, and hold it in your hand, it has potential energy. In fact, it has not one, but two kinds of potential energy. It has potential energy because it can drop down, and it also has potential energy because it can unwind. When you let go of the yo-yo, gravity pulls it down. It is also forced to rotate because the string is fastened to your finger and also wound around the yo-yo's axle. As it drops, the yo-yo's potential energy changes to kinetic energy, the energy of motion. Feedback on How Does a Yo-Yo Work?